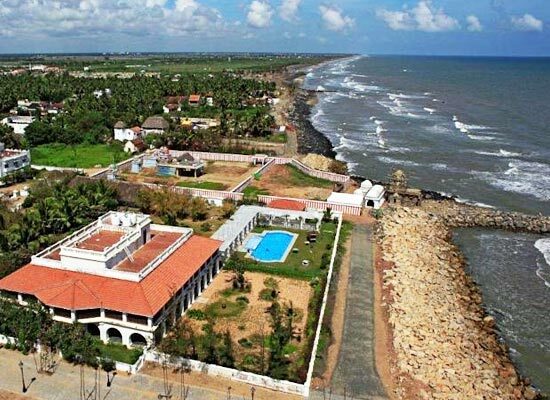 "Lying along the coast of the Bay of Bengal, the Bungalow on the Beach in Tranquebar (Tharangambadi) is a grand and stately colonial mansion. 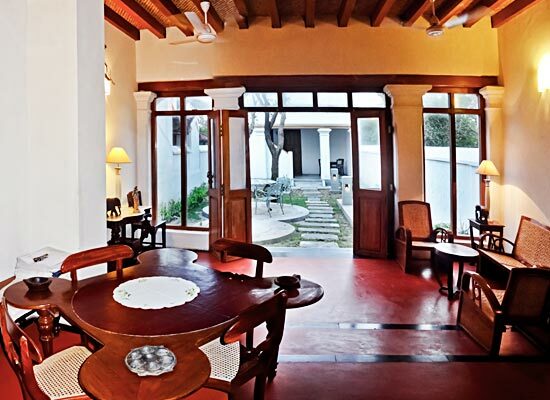 This 18th century Danish colonial house today is one of the best heritage hotels in Tamil Nadu. While the property has a 17th century Danish fort on the right, a 14th century Pandya temple bounds it from the left. Ideal for honeymooners and leisure vacationers, this hotel has 8 spacious well-equipped rooms with breathtaking views. The kitchen serves lip-smacking dishes of Indian and World cuisines. Guests can enjoy sightseeing, boat trips, beach walks and bird watching. Tranquebar was a Danish settlement and important trade port from 1620 to 1845. The Bungalow on the Beach comprises of restored buildings of two Danish admirals sent by the King of Denmark. Located on the first floor, this room is named after a Danish ship which sailed to this place. 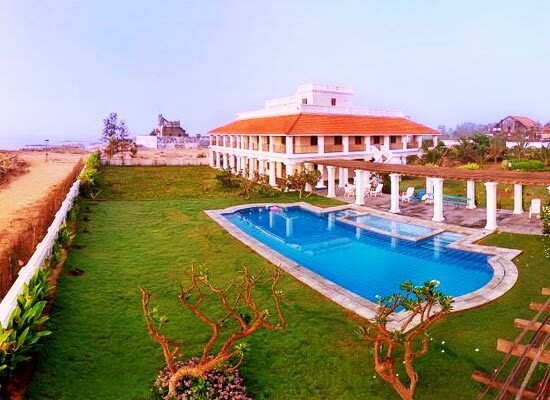 Savor wonderful views of the sea, the swimming pool, Dansborg Fort, and the 14th century Masilamani Nathar temple. In the huge walk-in dressing rooms, there is ample space to keep luggage. The four poster bed is decorated with lavender voiles. From the verandah, let the cool breeze come in. Positioned on the first floor, this room lies next to Prince Christian floor. The place blue décor and the views of the sea, offer a peaceful look to the room. Enjoy the cool breeze while you take a walk in the verandah. Named after the second spouse of King Frederick IV of Denmark and Norway, this rooms is placed on the first floor. 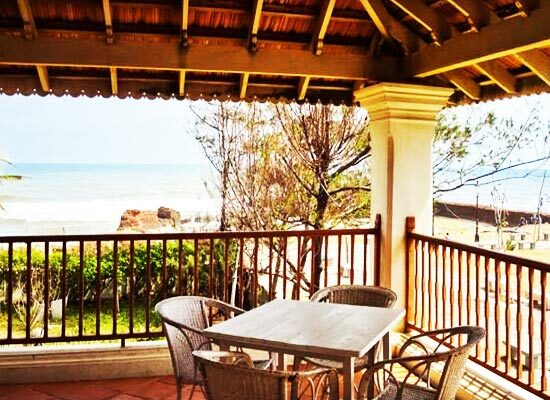 The verandah offers the wonderful views of the sea, and the Dansborg Fort. The sea-blue interior look wonderful. Lying on the first floor of the hotel, this room is named after the British Princess Louise, also known as Marchioness of Lorne and Duchess of Argyll after marriage. This is the largest room in the property and has a direct access to the verandah with wonderful views of the swimming pool, the garden, and the sea. 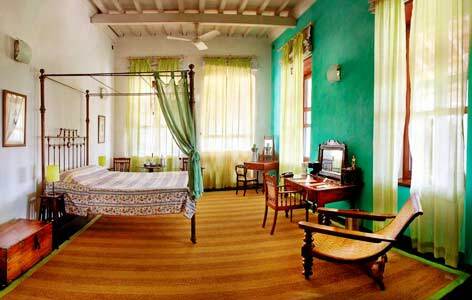 An old colonial almirah, brass four-poster bed with jade green voiles and a desk give a colonial look to the room. Striped sea grass mat and high louvered doors are the other attractions. 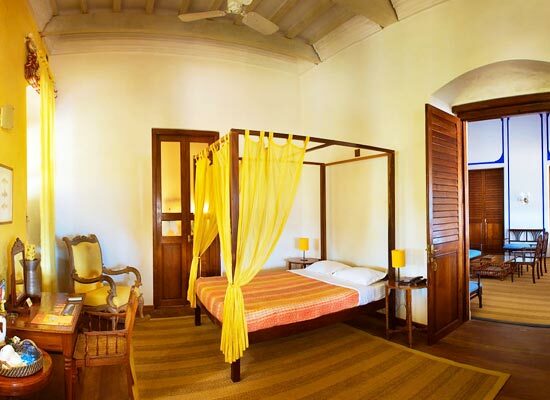 Located on the firstfloor, this wonderful room has stylish four-poster bed that blends well with the lemon color of the room. Striped sea grass mat, a desk, an old-colonial almirah and high louvered doors add an interesting color to the décor. An antique rocking chair is another interesting addition to the room. Guests can enjoy a direct access to the verandah with wonderful views of the surroundings. Named after King Christian VII of Denmark and Norway, this room lies on the first floor and offer a wonderful views of the hotel’s garden. This room is sandwiched between Princess Louise Room and Countess Moltke Room. Some of the interesting coastal traditional additions in the room are striped sea grass mat, an old almirah, a four-poster bed, a desk and high louvered doors. Lying on the ground floor, this room offers an access to the back verandah from where the guests can enjoy the views of the sea and the garden area. Old barrels have been used as bedside tables. The décor is wonderful. This room features an old colonial almirah, a four poster bed with pale pink voiles, a desk, striped sea grass mat and high louvered doors. Named after The Elephant, a well-known cliché of the Orient, this room is located on the ground level on the property, near the front entrance. The guests can access the verandah that overlooks the sea and the garden area. An old colonial almirah, a four poster bed with pale pink voiles, a desk, striped sea grass mat and high louvered doors add a character to the interiors. There is covered courtyard space with wonderful views of the hotel’s garden where the guests can savor lip-smacking delicacies of Indian and popular World fares. There are a number of venues where special meals can be arranged. Tranquebar was a Danish settlement from 1620 to 1845 and is a panchayat town now. Tranquebar is a Danish term and came from the native Tamil word Tarangambadi, meaning 'place of the singing waves'.